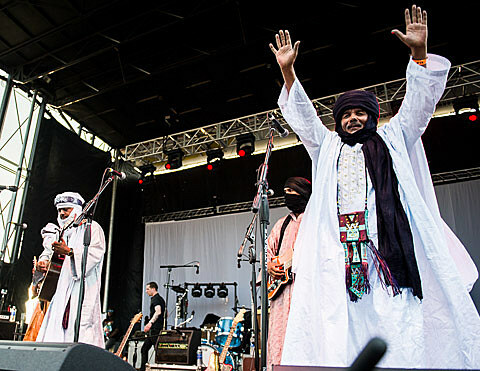 Malian band Tinariwen have announced that they’ll release a new album, Emmaar, on February 11 via ANTI-, who also released their last album, 2011’s Tassili. Like Tassili, which featured contributions from Nels Cline, members of TV on the Radio, and others, Emmaar will feature popular-music guests including Josh Klinghoffer (Red Hot Chili Peppers), Matt Sweeney (Chavez, Zwan), Saul Williams and others. It’s being produced by Vance Powell, who often works with Jack White. You can watch a video for “Toumast Tincha” off the upcoming album, below. Following the album’s release, Tinariwen will head out on a US tour that brings them to SXSW for their first time and NYC for two shows at Brooklyn Bowl on 3/23 & 3/24. Tickets for those shows are not on sale yet, but you can check Ticketfly for updates. UPDATE: Tinariwen also added another NYC show happening on February 3 at Rough Trade (tickets).